Video game culture, it seems, is continuously entering more areas of society. The often highly serious world of fashion is the latest to realize the commercial value of linking products with gaming, as renowned fashion house Louis Vuitton has revealed none other than Final Fantasy’s Lightning as its new model in its latest campaign. The French Fashion house’s creative director, Nicolas Ghesquiere, unveiled Lightening as the face of the Spring-Summer 2016 campaign, saying that the character is a “genuine hero.” He shared the video for the new ‘Series 4’ ad – which you can see below – on his personal Instagram. 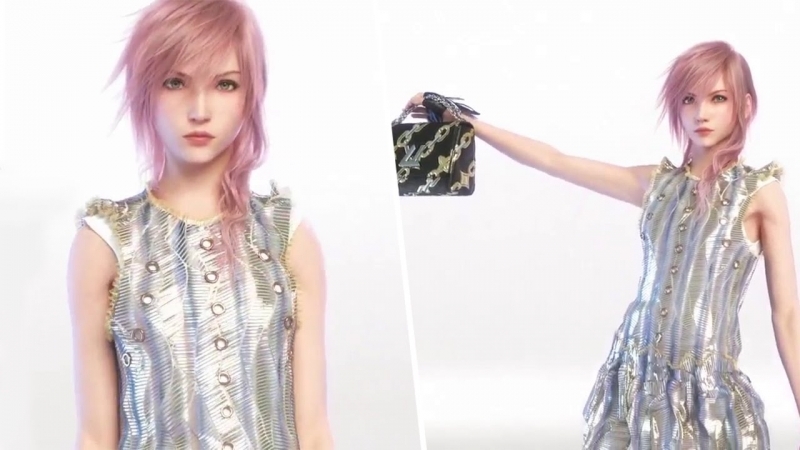 Ghesquiere said that the campaign’s art is the result of a collaboration between Square Enix game artist and Lightning’s main character designer Tetsuya Nomura and the Japanese company’s Visual Works CG movie production department. The project isn’t the first time that Ghesquiere has shown his fondness for mixing the worlds of high-fashion and digital technology. Louis Vuitton’s Sping-Summer 2016 fashion show had numerous references to Virtual Reality, anime, sci-fi and Minecraft, and many of the designs were inspired by heroines from video games. While this is the first time a big fashion house has officially used characters from a game to show off its new clothing line, the Final Fantasy cast were previously used to model Prada gear in a 2012 Japanese magazine spread. Louis Vuitton isn’t the only big fashion company to turn to video games for inspiration. Earlier this month, Italian fashion firm Moschino announced a partnership with Nintendo for the Super Moschino project, a celebration of 30 years of everyone’s favorite Italian plumber, Mario. The Moschino project included various items of clothing featuring characters from Nintendo's world, as opposed to a CGI version Mario modeling some Moschino designs.